From Left-Bill Carson from the Portsmouth Elks Lodge BPOE No. 154., presenting a check to Mark Hunter for the Steven Hunter Hope Fund. March is said to be National Child Nutrition Month and it was with that in mind, that the Elks wanted to get a grant to help out in the nutrition of local school children. 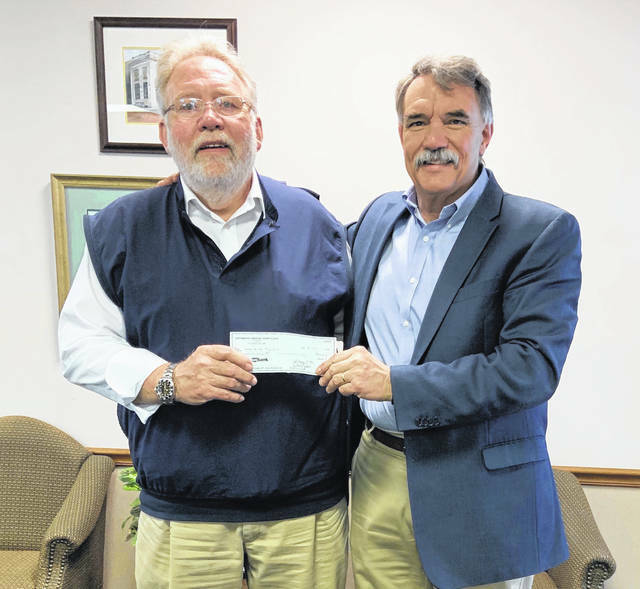 The BPOE (Benevolent and Protective Order of Elks)Portsmouth Elks Lodge No.154, applied and received a grant to help the Stephen A Hunter Hope Fund, in the amount of $2000. The Steven A. Hunter Hope Fund states, “It is our mission to improve the lives of economically disadvantaged children in Scioto and surrounding counties by supplying basic needs and opportunities and fostering hope for their future. Our primary focus is childhood hunger and it is addressed through Steven’s Power Pack Program, providing food for the weekend for elementary aged school children with financial needs.” Steven’s Power Pack now serves over 1,300 hungry children every weekend during the school year in 20 different public schools.